Peace Corps Online: 2009.06.13: June 13, 2009: Headlines: : Huffington Post: Laurence Leamer writes: "Join Us, Mr. President!!!" 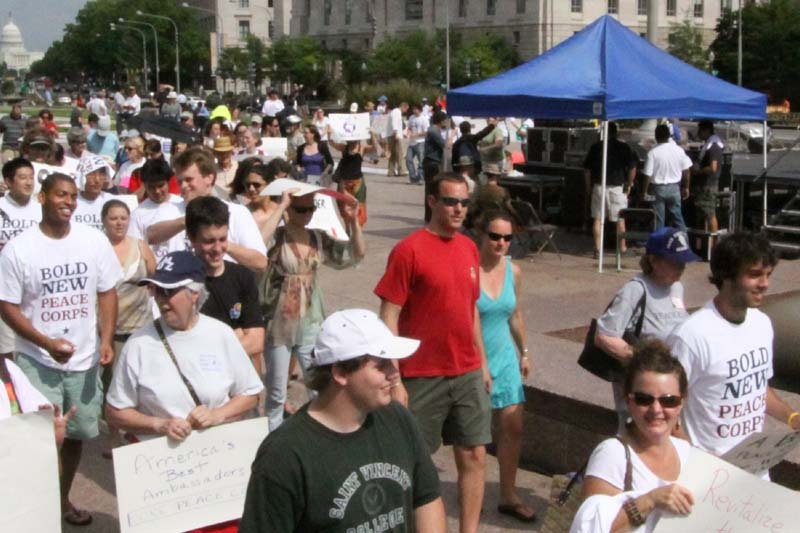 2009.06.13: June 13, 2009: Headlines: : Huffington Post: Laurence Leamer writes: "Join Us, Mr. President!!!" Peace Corps Online: Peace Corps News: Library: Peace Corps: President Obama: 2009.12.03: Rajeev Goyal writes: What Happened to Obama's Promise of 16,000 Peace Corps Volunteers by 2011? 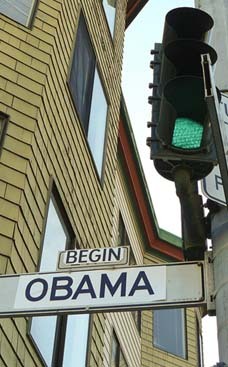 : 2009.06.13: June 13, 2009: Headlines: : Huffington Post: Laurence Leamer writes: "Join Us, Mr. President!!!" Laurence Leamer writes: "Join Us, Mr. President!!!" A Bold New Peace Corps! For some inexplicable reason, the most inspiring, most capable leader in generations has not followed through on his campaign promise to double the size of the Peace Corps. He is going ahead tripling the domestic volunteer corps, and his inaction makes no sense. 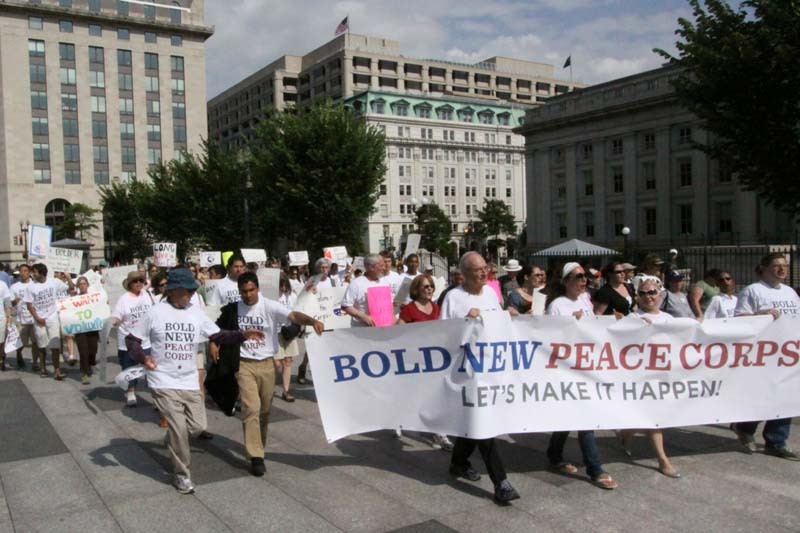 I was the next-to-the-last speaker Saturday at a rally in Washington to build a bold new Peace Corps. Rajeev Goyal, the Morepeacecorps.org national organizer, and I had decided to do this rally only nine days before. It would have been a formidable new task even if we have done nothing else. But we were already working ceaselessly to get the House of Representatives to appropriate the $450 million that would allow the Peace Corps to grow and to reform. We were close to success in the House thanks to a relentless group of representatives and legislative aides. Our problem was not only what would happen in the Senate but President Obama. For some inexplicable reason, the most inspiring, most capable leader in generations has not followed through on his campaign promise to double the size of the Peace Corps. He is going ahead tripling the domestic volunteer corps, and his inaction makes no sense. The administration budget contains only $373 million for the fiscal 2010 budget, enough to keep things the way they are, no money for the 20 new countries clamoring for volunteers, no room for the 25,000 who this year have expressed interest in applying, 40% more than last year. There is no new director and the downtown headquarters is practically moribund, waiting for something to happen. And so we decided to stage a rally, and we worked almost around the clock to make it happen. And so we decided to stage a rally, and we worked almost around the clock to make it happen. 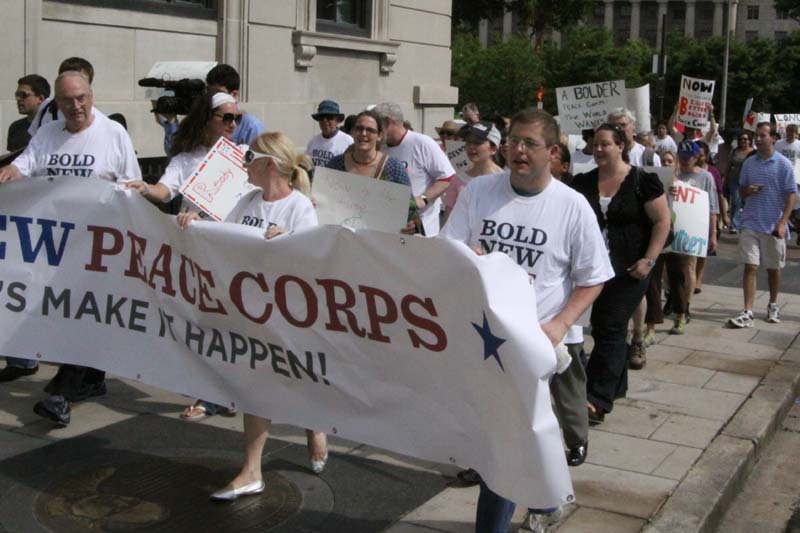 We had the stalwart support of Kevin Quigley, the president of the National Peace Corps Association, who mobilized his troops and whose organization funded the rally for one of its programs. 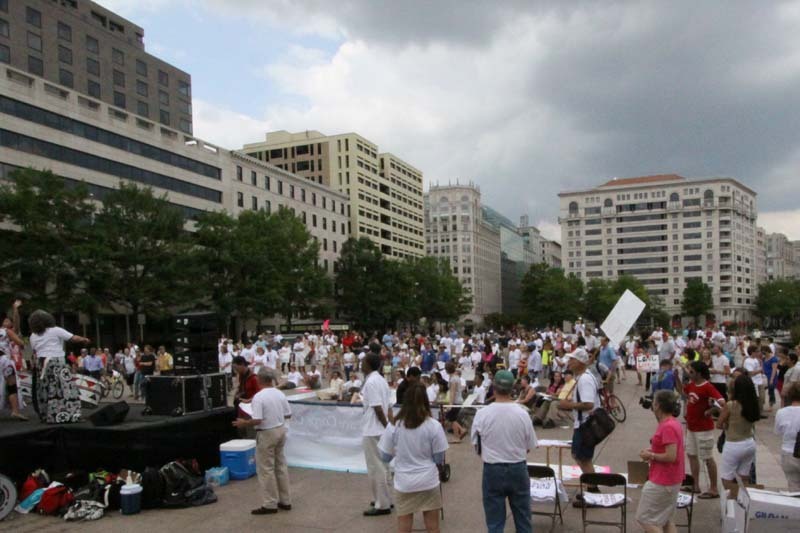 It was amazing how everything came together in Freedom Plaza two blocks from the White House. We had called Anthony Johnson, the Jamaican ambassador, the day before, and he gave a passionate, compelling speech. Former Senator Harris Wofford gave a marvelous talk, putting our movement in historical context. 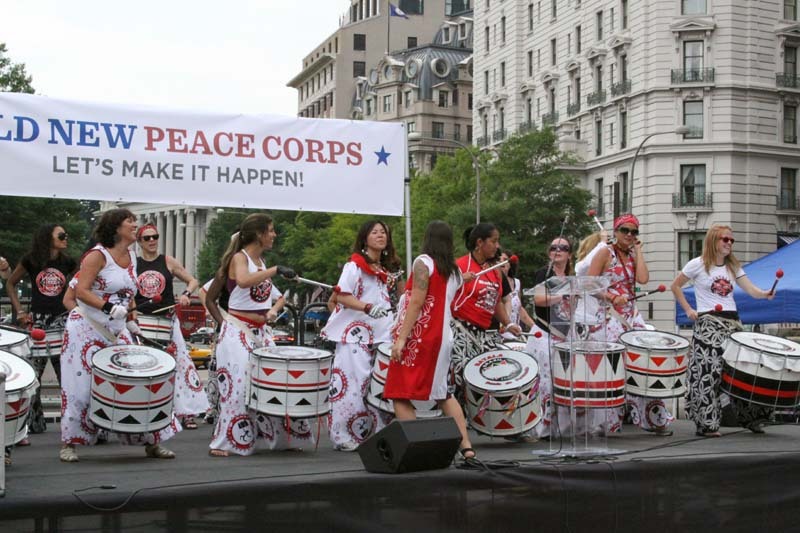 The wonderful musicians performed for free because they believe in a bold new Peace Corps. 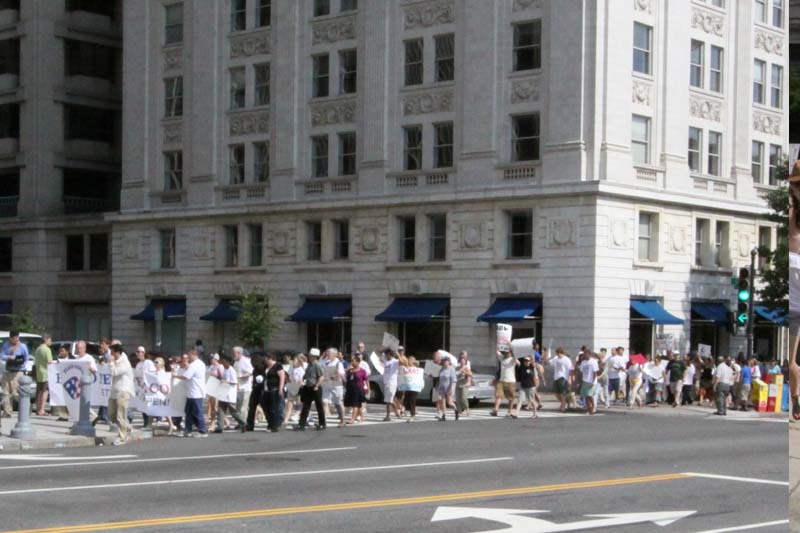 We stretched out a hundred-feet-long scroll in which rally goers wrote letters to the President and First Lady which we plan to deliver to the White House. Even the weather gods cooperated, holding off on threatened thunder storms. Speaker after speaker made compelling cases for an enlarged, reformed Peace Corps reaching out to the world in powerful new ways. 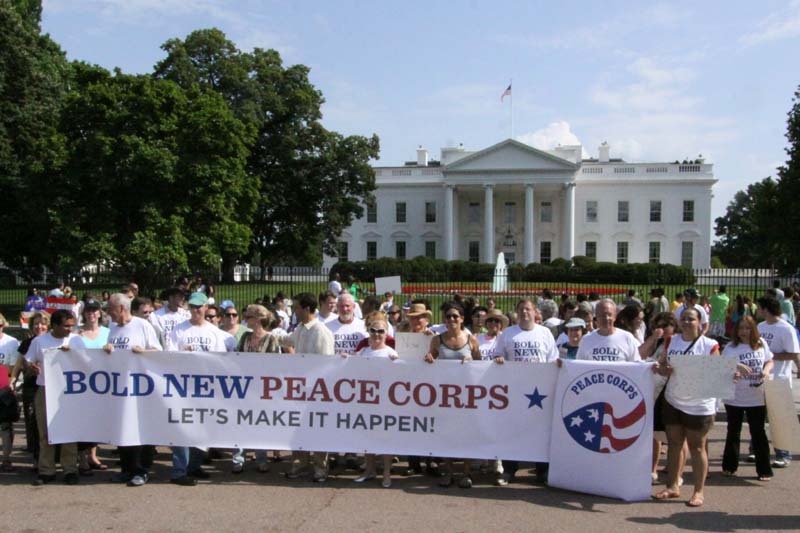 A Bigger, Better, Bolder Peace Corps! I see 195,000 Returned Volunteers! I see this great space filled to over flowing. I see 195,000 returned volunteers standing proudly in their bold new Peace Corps t-shirts. Up front laughing, jumping up and down with joy, I see Sarge Shriver telling us we are doing the right thing in building this bold new Peace Corps. I see the flags of the 139 Peace Corps countries. I see millions of supporters. I see America. I see the world. "And so I look out now on this immense plaza and I see a scene I thought I would never see. I see this great space filled to over flowing. 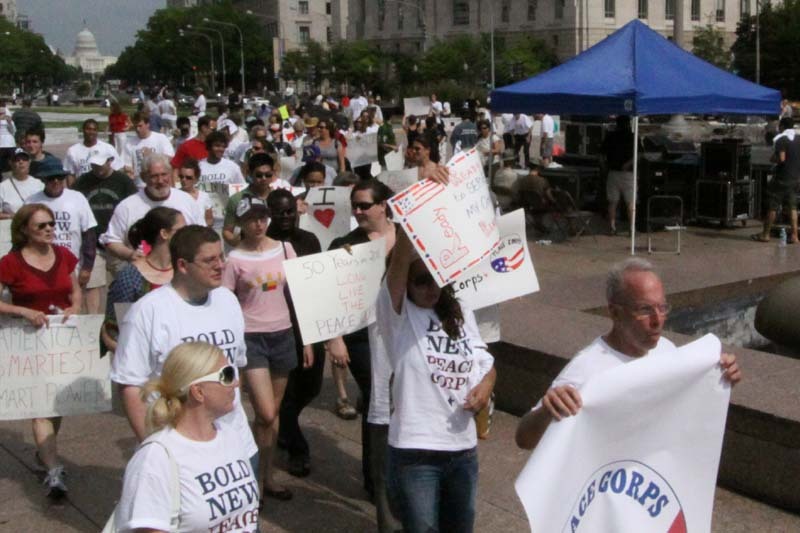 I see 195,000 returned volunteers standing proudly in their bold new Peace Corps t-shirts. Up front laughing, jumping up and down with joy, I see Sarge Shriver telling us we are doing the right thing in building this bold new Peace Corps. I see the flags of the 139 Peace Corps countries. I see millions of supporters. I see America. I see the world. And I hear them shouting in unison in their great voices. I hear them shouting so loud, so clear, that two blocks away in the White House, the president hears the voices of the Peace Corps calling him to be true to his vision. He hears us and he acts. Then Tim Shriver got up and gave a powerful extemporaneous speech that was a high point of the rally. To my mind, he is so far the best candidate to become the director that there is no second candidate. Some say he is not a great administrator. That was the same criticism that was made of his father and Sarge was the best director in the history of the Peace Corps. A Bigger Peace Corps Now ...Not Later! We were powerful in passions and belief, and strong in our voices, and we turned as one person and marched to stand in front of the White House and to shout out so loud and so strong that surely anyone inside would have heard us. After his formidable speech, Tim led us to the White House behind the flag of the Peace Corps and our banner for a bold new Peace Corps. 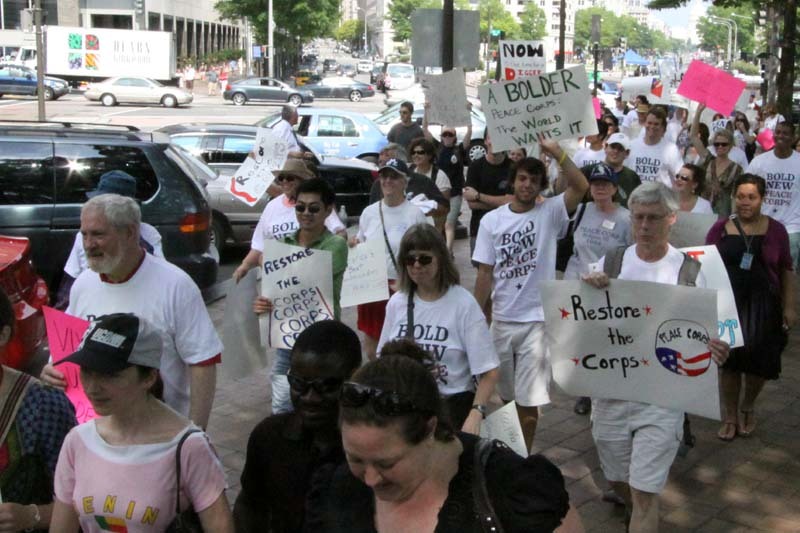 As we walked up 14th Street, Tim led us in the chant "Mr. President" and "Bold new Peace Corps." We were powerful in passions and belief, and strong in our voices, and we turned as one person and marched to stand in front of the White House and to shout out so loud and so strong that surely anyone inside would have heard us. 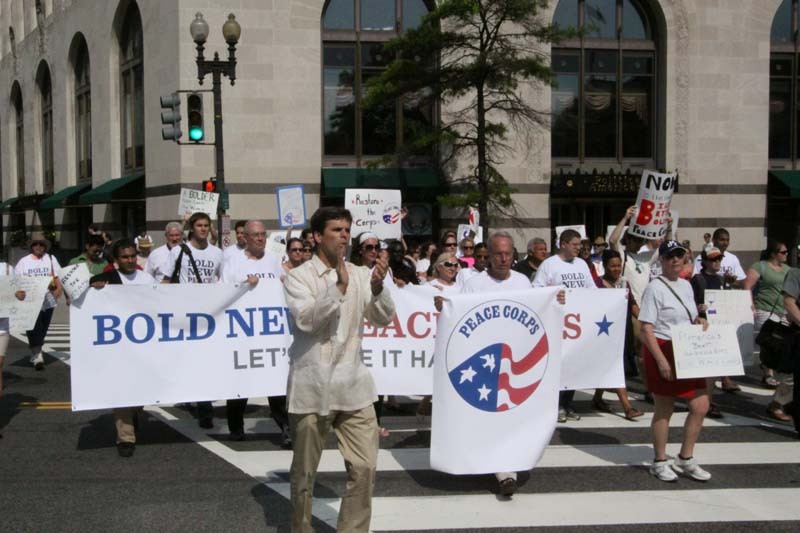 The son of the founder of the Peace Corps leading our march was one of the most powerful acts of political symbolism I have ever seen. The son of the founder of the Peace Corps leading our march was one of the most powerful acts of political symbolism I have ever seen. You will read about this here but you will read about it nowhere else. Last week I called newspapers and television news desks and tried to get them out there, but except for the Washington Post, no one came. The Post did a small story today, writing "dozens rally." That's literally true. So is "dozens march in St. Patrick's Day Parade." When I stopped counting there were over 300 people in our enthusiastic crowd. Actually, the only media to contact us has been Newsmax.com, the conservative website, who are doing a piece on Republicans and the Peace Corps. It's another indicator of the growing power of Internet journalism, keeping ahead of their newspaper rivals. If we are able to get the righteous appropriation of $450 million through Congress and build and reform the Peace Corps, the traditional media will have missed an important, inspiring story. And if we are successful, the series of stories I have done on Huffingtpost.com will be one of the keys. Posting them on the site is just the beginning. We email the pieces to tens of thousands of our supporters who email them to their friends and lists, and it has helped to build a movement of fervent supporters. Two weeks ago I wrote an "Open Letter to Chairman Lowey" and asked readers to send in their own open letters to Rep. Lowey who is Chairwoman of the House State and Foreign Operations Subcommittee. Lowey has the power to give the Peace Corps the full $450 million in the Foreign Operations Appropriations Bill. The response was astounding, hundreds of serious, well conceived, well written letters. We chose 67 letters and turned them into an exquisite, professionally printed book titled WE IMPLORE YOU, CHAIRWOMAN LOWEY. Last week Rajeev and I handed the first copy to Rep. Lowey in her office and told her that every member of Congress will receive a copy. Wednesday the subcommittee is scheduled to meet and on that day we believe it will make history by giving the Peace Corps the full appropriation. Wednesday the subcommittee is scheduled to meet and on that day we believe it will make history by giving the Peace Corps the full appropriation. But we must continue to apply the pressure with constituents calling the subcommittee members' offices until they sound like bookie joints. For their names and contact information, go to http://www.morepeacecorps.org/subcommittee/facts. Then the struggle moves to the Senate. There our first task will be to convince Chris Dodd, a returned volunteer, and Patrick Leahy, a man of unmovable principle, that they must lead the fight for a bold new Peace Corps joined on the Republican side by their ready colleague Orrin Hatch. We know that you heard our united voices Saturday. When we come back, we will march even stronger in number and even louder in voice. We will be shouting, "Join us, Mr. President!!!" You belong with us. You are one of us. And we know that when you finally decide to act, you will build Obama's Peace Corps, an emboldened institution for a new age. But, Mr. President, we need you. We know that you heard our united voices Saturday. When we come back, we will march even stronger in number and even louder in voice. We will be shouting, "Join us, Mr. President!!!" You belong with us. You are one of us. And we know that when you finally decide to act, you will build Obama's Peace Corps, an emboldened institution for a new age.